Fennel recipes are very popular in Mediterranean diets. It is used often in Italian recipes and this recipe is a variation of a favorite traditional Italian salad. Fresh fennel is unmistakable for its delicate crunch and light licorice flavor. It is often used in salads, sliced very thinly. Using a sharp knife, cut the peel and the white pith from oranges. Working over a large bowl, cut between the membranes to release the segments. When you are done cutting the segments, squeeze the membranes to release any remaining juice into the bowl. To the oranges, add the fennel, red onion, mint, salt, pepper and oil, gently tossing all to combine. Sprinkle with the olives. To prepare the bulb for your fennel recipes, trim off the tough stalks from the top and the bottom root end before cutting the bulb in half. Chop any feathery fronds from the stalks and sprinkle on top of the salad with the olives, if desired. If the outer layers of the bulb are tough and stringy, you can discard them or peel off the outer layer with a sharp vegetable peeler. This recipe comes from a fabulous cookbook by Camilla Saulsbury called 5 Easy Steps to Healthy Cooking: 500 Recipes for Lifelong Wellness . To me, thinly slicing the fennel is important. I find that fennel can be a bit of a strong flavor, but sliced very thinly it mixes in nicely with the other salad ingredients. Leave it in larger slices only if you really love the taste of fennel. 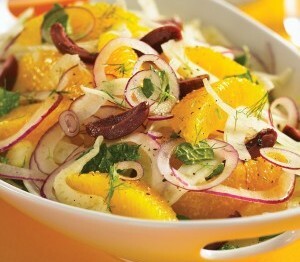 This fantastic fresh fennel salad recipe is combines the fennel with sweet oranges, red onion, black olives and cooling mint. The acid in the oranges cuts the fennel flavor just enough. The red onion adds both color and a bit of kick. The olives add that briny flavor and of course mint adds a touch of coolness. Together it is a wonderful mix with the addition of olive oil and salt and pepper to season it. I would use your best olive oil here. A nice extra virgin olive oil adds another layer of fantastic flavor to this healthy salad. This recipe is actually extremely healthy. Every ingredient in it has fantastic health benefits. It is also very low carb, gluten free and a great diabetes recipe, so it suits most restrictive diets. I would pair this healthy salad with something like our baked garlic chicken or pasta with a light tomato sauce. Fennel recipes like this would also work well with this recipe for angel hair pasta with lemon and garlic. Find the full recipe here.